This kind of color inkjet printer is widely applied to print patterns on paper, PVC, advertising banner, mesh fabrics, adhesive vinyl, etc. 1. The printing precision of our color inkjet printer is 600 dpi, which ensures the images printed by this inkjet printing machine feature high definition. 2. This color inkjet printer adopts 16 Spectra Skywalker printing heads with 4 colors, and the maximum printing speed reaches to 100sqm/hr. 3. It can print such materials with width of 5 meters. Thanks for visiting Shenzhen ShenZhen Runtianzhi Digital Equipment Co.,Ltd. 's website! We are a specialized color inkjet printer manufacturer in China. 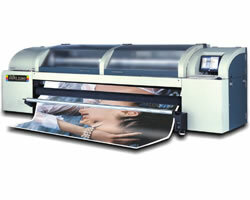 Our inkjet printers can be used as ceramic inkjet printer, acrylic printer, glass printer, leather printer, etc. If you are in need of these products, please contact us directly! At Runtianzhi, we will do our best to serve you! File formats Bitmaps, TIFF, JPEG, Postscript 3, EPS, PDF, etc.